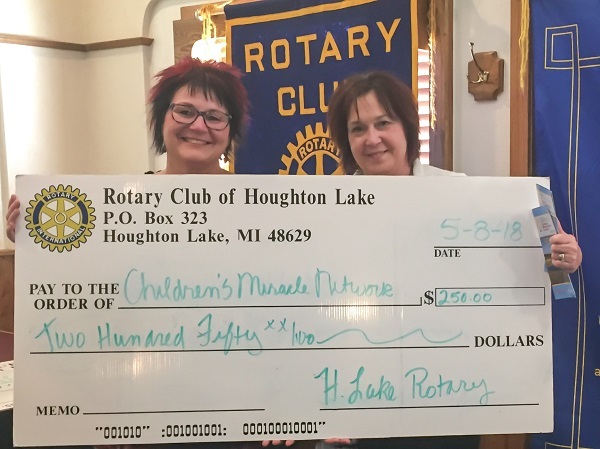 Diane Ocenasek spoke to the Rotary Club of Houghton Lake about the Children's Miracle Network which raises funds for children's hospitals, medical research, and community awareness of children's health issues. Our area has raised over $107,000 and assisted 95 children in Roscommon county alone. A fundraiser golf outing for Children's Miracle Network Hospitals. Sponsored by Re/Max of Higgins Lake and Mid-Michigan Community Health Services will take place June 19th at Forest Dunes Golf Club. Rotary President Denise Stefanko presented Diane a check for $250 to support the program.